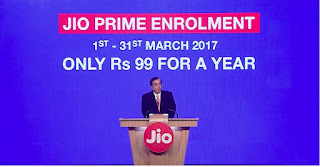 Reliance has announced Jio Prime Membership Program for Rs.99. You can Enrol for JIO Prime Membership through MyJio website or a retail store between 1st to 31st March. Jio Prime Members can continue enjoying the unlimited benefits of JIO NEW YEAR OFFER until 31st March, 2018. Jio Prime membership will allow users to enjoy its 4G services at Rs 303 per. Jio’s bouquet of apps worth Rs 10,000 that include JioPlay, JioOnDemand, JioBeats, JioMags, JioXpressNews, JioDrive, JioSecurity and JioMone are included in the Jio Pime membership package as well. Ambani said Jio’s services has crossed the 100 million mark in just 170 days and India is now the number one country in the world in terms of data usage. Jio had announced its 4G tariff plans for postpaid as well as prepaid users last year. Ambani said Jio customers had consumed over 100 crore GB of data in January 2017. You can apply for Prime membership either at any of Jio’s approved retail stores or on its official website. 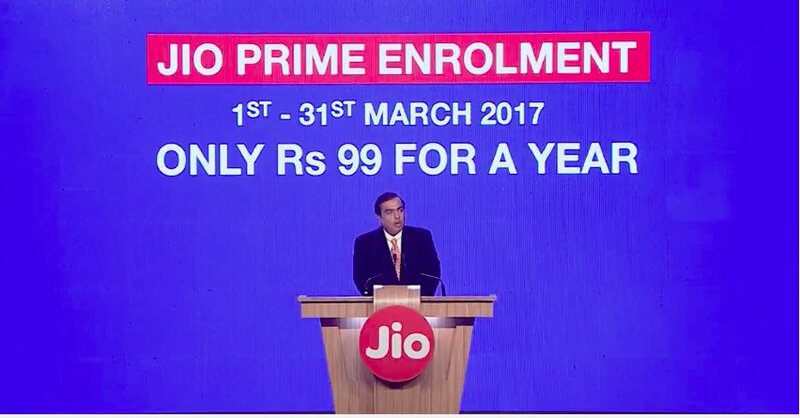 You are required to have a Jio SIM activated before March 31st in order to subscribe for the Prime membership.